The HTC One mini 2 sees a departure from HTC's Ultrapixel sensor technology and comes with a standard 13 MP snapper on the back, sided by a single LED flash. The main camera sensor is a 1/3.06" CMOS with small 1.12 µm pixel size (compared to the 2 µm of the HTC One M7 and M8). The sensor has a native 4:3 aspect ratio as opposed to the 16:9 wider aspect of its predecessor - photos come out with a resolution of 4128 x 3096 - more than three times the pixel count of the HTC One (M8). This camera is not backed by HTC proprietary ImageChip so a handful of options are missing (Zoe mode most notably). It does have HDR, Panorama (with a digital horizon level), geo-tagging and image effects. The more advanced settings are hidden by default, but you can also control ISO, exposure compensation, white balance and a few other image adjustments. 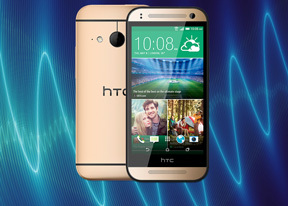 The HTC One mini 2 has a 5MP front-facing camera with a BSI sensor and a dedicated selfie mode. From the settings you can enable smile shutter and adjust the Make-up level, which tries to digitally pretty you up. We have a front-facing sample prepared for you below. The HTC One mini 2 is one of the best cameraphones to come out of the company's factories. It's much the same situation as what we saw on the HTC Desire 816. The two cameras produce identical results. Right off the bat, the detail level is very good across the frame. Images come out sharp but the fine detail remains mostly untouched - read not oversharpened like on recent Samsung flagship phones. Edges are almost as sharp as the center, which is very impressive and a step up from the HTC One (M8)'s photos. The HTC One mini 2 picked exposure really well each and every time. Colors look punchy and vivid. There's a fair share of digital noise but we kinda prefer this sparing noise reduction algorithm. An overeager noise reduction would have smeared the fine detail along with the noise so we prefer the balance in this tradeoff just the way HTC has picked it. Face detection on the HTC One mini 2 is always on and cannot be turned off in the settings. It works really well and can recognize a face immediately and even track it well when it moves across the frame. The downside is that when face detection captures a face it will expose for it, which would sometimes ruin your overall exposure, which is a bummer. This can be fixed by manually locking exposure where you want it to be but then you risk losing focus of your subject. HDR is short for High Dynamic Range and the HDR mode of the HTC One mini 2 camera snaps a couple of photos with different exposures and then combines them into a single photo. It seems the HDR mode tends to expose for the highlights and then brighten up the shadows in the scene. This in turn produces images with nice and even exposure, without a nasty overcontrasty, exaggerated look. You'll note in the images below that the sky is already very well exposed and only slightly accented in the HDR sample but the part of the scene below the sky sees a significant bump in exposure. The HTC One mini 2 is also a great performer when it comes to macro shooting. It would focus from as close as 10 cm. Looking at the macro sample with the little text sign you'll notice that each little fine thread is delivered in great detail. Here goes a sample taken with the front-facing 5 MP snapper on the HTC One mini 2. It produces good detail all around but make sure you don't get too close as close subjects are out of focus. There is actually a sweet spot somewhere at an arm's length from the camera. The image further away from the camera is out of focus again. Overall, the image quality is not what the 5MP F/2.0 specs suggest on paper. And here go a couple of 16:9 samples we took. The second one is an HDR shot. We're glad to see the amount of good work that has gone into the HTC One mini 2 camera. It performs great and offers a good deal of detail. What we like most about the snapper is how mature it renders images - something that's lost on most current top tier smartphones on the market, save for a few exceptions. Here's the HTC One mini 2 in our photo quality comparison tool. It's designed to allow you the ultimate pixel-peeping experience and the option to challenge the smartphone to any of the many tested shooters we've had. The HTC One mini 2 offers 1080p videos at 30fps, though there's also a 60fps mode at 720p. The front-facing camera can also record 1080p videos. Other options include slow-motion video but this one drops the resolution to the measly 768 x 432px. Finally there are image effects and settings for ISO, exposure compensation and white balance. The 1080p videos captured by the HTC One mini 2 carry a bitrate of around 20 Mbps, which is normal for this resolution. Framerate was a constant 30 fps throughout the video. Audio bitrate sits high up with 193 Kbps and offers two channels (read stereo) and has a regular sampling rate of 48 kHz. As for quality, we're impressed. The HTC One mini 2 is one of the best camcorders to come out of HTC portfolio. It resolves plenty of detail, we'd say about on par with the HTC One (M8) and usually gets exposore spot on. Just as we saw with the HTC Desire 816, colors tend to be a little on the saturated side but some users prefer them like this. Sharpness is not at its best towards the edges. Here's a sample to watch. Or you can download a 0:08s, 20.2MB sample taken directly from the device. In the video comparison tool you can face the HTC One off against any of the many camcorders we've tested over the years.